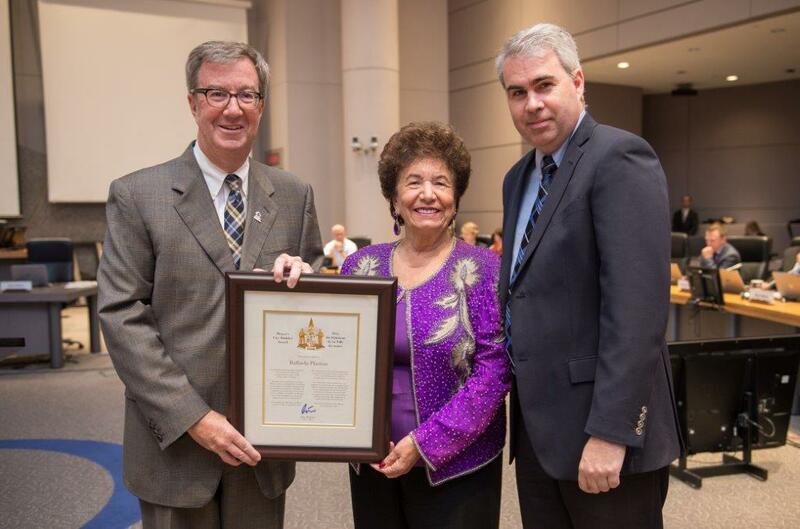 Mayor Jim Watson and Councillor Riley Brockington recognized Raffaela Plastino’s commitment and dedication to the community by presenting her with the Mayor’s City Builder Award at today’s City Council meeting. Plastino and her family emigrated from Cleta, Italy in 1949. After landing in Halifax, they journeyed to Ottawa where they were welcomed by friends and family. Over the years, Rafaela has worked tirelessly for the Canadian Italian community and has always been ready to lend her organizing skills to help out a good cause. One of Raffaela’s major contributions has been the formation and promotion of Italian Week which started in 1974. She has dedicated over three decades in various capacities, having served as the president for 8 years and vice-president for 12 years. She has taken the lead, along with other committee members, to elevate this event from a local community celebration to a full-fledged popular extravaganza that is now advertised on tourist information sites throughout North America. Raffaela has also been involved in building the long-term care centre for seniors known as Villa Marconi. She also went door to door in the community to raise funds to help people in the Friuli region of Italy devastated by strong earthquakes in 1976. Raffaela has never shied away from hard work and long hours because her dedication to the community has always come first. She became the go-to person for translation services, a driver for medical appointments, a referral service for legal and medical services, and a source of support for people in dire straits. She has become well known for her willingness to help others. Her efforts have increased revenues for many businesses in Little Italy and around Ottawa, but most importantly have brought people together to savour Italian heritage.